La petite fille is a classic canvas from Lemieux's body of work dealing with a single figure either in a landscape background or, as here, in a simplified interior. Essentially these figures are symbolic of the human being's place in the universe, and are replete with psychological implications. Lemieux scrutinizes each subject with a penetrating eye. He reduced the bodies of his people to simple shapes, and their faces to the most basic details of their features. He did not go in for the emotionally demonstrative, but took a detached view and searched for subtleties. The experience of solitude is a recurring theme - the kind of solitude that contains in it an affirmation of individuality. Lemieux did not reveal too much about this young girl, keeping a certain intriguing ambiguity. 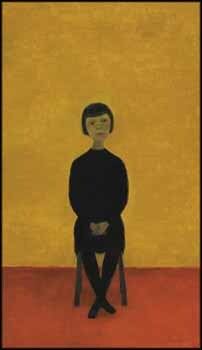 She appears self-possessed, sitting patiently for the artist, and her crossed hands and feet show a demure demeanour. Her simple and well groomed appearance and direct gaze show confidence, yet in her face are subtle tones of wistfulness and, emphasized by her very slender, delicate neck, vulnerability. Lemieux's work was generally known for its subtle colour tonalities, but La petite fille is radiantly colourful, making quite an impact with its rich golden yellow and red backdrop. His surfaces are rich and modulated, with the layering of the brushwork in the yellow revealing different tones, adding to the glowing effect. The dark dress of the figure strongly contrasts with the hot hues of floor and wall, which act to propel the figure forward. Formally, the figure is a flattened vertical against two horizontal colour-field planes. La petite fille is dated 1970, a time when Lemieux's prominence in the art world was well established. In 1966 he was in the group show Chefs-d'oeuvre de Montréal, which toured seven American cities, and the Art Gallery of London, Ontario, mounted his first retrospective. The following year he was included in the National Gallery of Canada's important exhibition Three Hundred Years of Canadian Art, and a retrospective began at the Montreal Museum of Fine Arts that traveled to the Musée du Québec and the National Gallery of Canada. The accolades continued with inclusions in museum shows, the publication of books and a 1969 National Film Board documentary, Québec en silence. Lemieux's paintings emerged from a time in Quebec when the art world had become increasingly polarized between the figurative and the abstract. Lemieux chose the figurative, and when he transitioned into a more simplified expression of the figure and landscape in the 1950s, he became renowned for his unique and compelling imagery. His works are a singular expression of his region and its people, but in their penetrating consideration of the human condition, they are universal. La petite fille, with its delicate psychological atmospheres and painterly prowess, is a prime example of this.